* I graduated from the Department of Electrical Engineering, Tokyo University of Science (Kagurazaka Campus) in March 1980. The theme of graduation research was "Linear Motor Car and its Control". 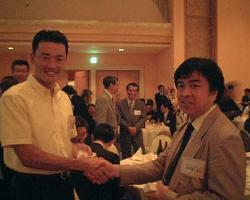 * I joined Nissan Motor in April 1980, and was engaged in the design of automotive electrical equipment. The Design and R&D Department of Nissan Motor gathered at Nissan Technical Center (NTC) in Sagamihara-city. In the photo on the left shows that Employees of Nissan visited NTC large premises with their family, before the construction of NTC was started in 1981. * During the 2 years since April 1981, I studied Remote Sensing of the Meteorological Satellite "NOAA" and "Himawari" at the Professor Mikio Takagi's Laboratory and the Multidimensional Image Processing Center of Industrial Institute of Science (IIS), the University of Tokyo in Roppongi, Minato-ku, Tokyo. When people came to see our Laboratory of IIS, I explained them our research. As the Meteorological Satellite "Himawari" was famous for weather forecast on the TV News, many people visited here. * Since May 1983, I have started to work at "Hitachi Shonan Denshi" (currently "Hitachi Information and Communications Engineering") and at "Hitachi, Ltd". I have been working at Research and Development Department on Wireless Communications Equipment, Satellite Ground Stations, RFID and Optical Communications Systems. * In September 1987, I established a Private Wireless Engineering Company "AMPLET, Inc." in Akihabara, Tokyo, and I was appointed a President of this company. I was longing for a designer room in my father's company (architecture). When I started my job activity, I bought an oscilloscope in Akihabara and installed a personal computer (NEC PC- 8001mk2 … a Birthday Present from my Wife) at a small office. And I built a DC Power Supply, too. * After I established "AMPLET", I worked as a Technical Advisor, as well as a Researcher at some domestic and foreign companies, and a Lecturer at some Universities (the University of Tokyo, Tokyo Denki University, Chungnam National University (Korea), Nihon University, and so on). * From the beginning of the 1990s, I was invited by the SMIPC (Small and Eedium Industory Promotion Corporation of Korea). I lectured the guidance for Wireless Communications Technology for many Korean companies. And I designed the first ever CDMA mobile phone terminal (IS- 95) in Korea. * I was hired as a researcher at the University of Tokyo since 2010, and started research on Ventricular Assist Device (VAD), Medical ICT, and Human Body Communication at the University of Tokyo Hospital. * In March 2016, I resigned as a representative director of AMPLET, Inc., and was appointed as a director of the Amplet Communications Laboratory. Currently, I am working as a Technical Consultant to solve problems with customers, and I am developing and prototyping Short-range Wireless Communication Equipment, RFID, Millimeter Wave Radar, Antennas, and Human Body Communication Equipment, etc.